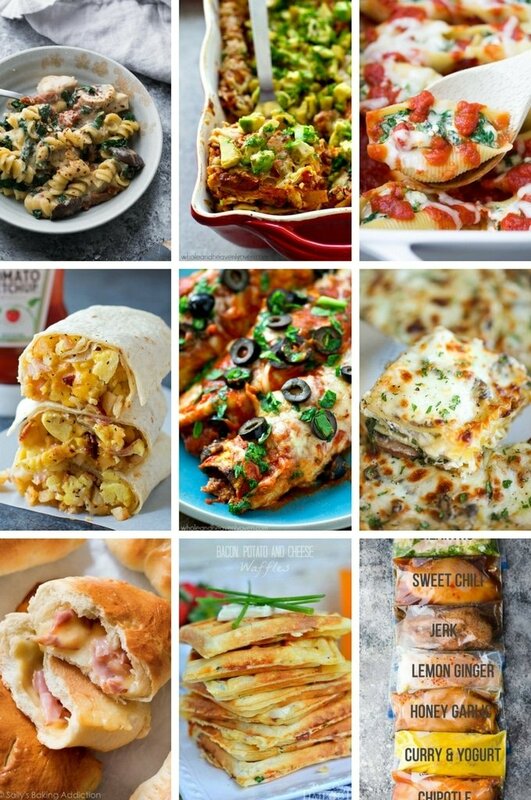 Make meal times easier with these 35 easy freezer meal recipes! 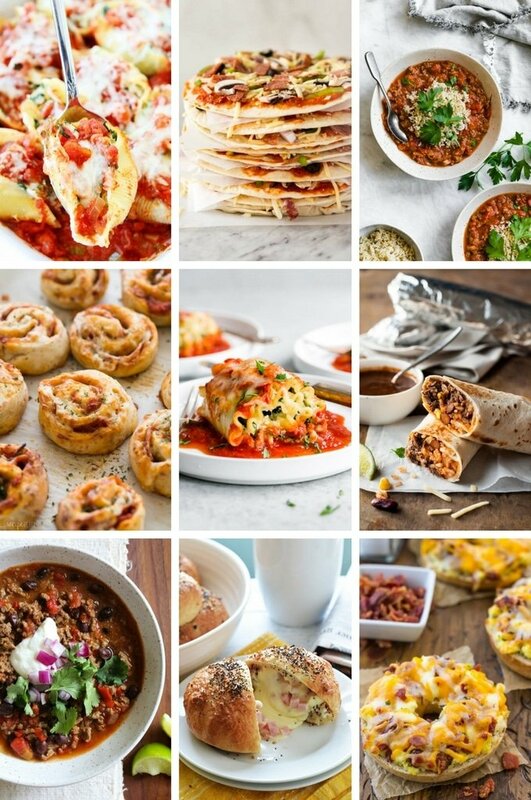 There are freezer meal ideas for breakfast, lunch and dinner with everything from hearty soups to casseroles, pizza, burritos and more! Stock your freezer with delectable dishes like lasagna, chili, marinated chicken, pastas, pancakes and waffles, then simply thaw and reheat for an instant meal. Freezer meals are perfect for those days when you’re just too busy to book! Weekdays can be crazy busy for moms. There are daily errands to run, kids sports activities, appointments to make and about the time you want to sit and relax for a moment you remember – it’s dinner time! We love easy freezer meal recipes in our home. Spend a day prepping a week’s worth of meals and toss them in the freezer. There are so many different meals that freeze beautifully and taste just as good as when you’ve cooked them fresh! It’s not just dinner that you can freeze. There are also options for breakfast and lunch freezer meals to make busy days go a little smoother. 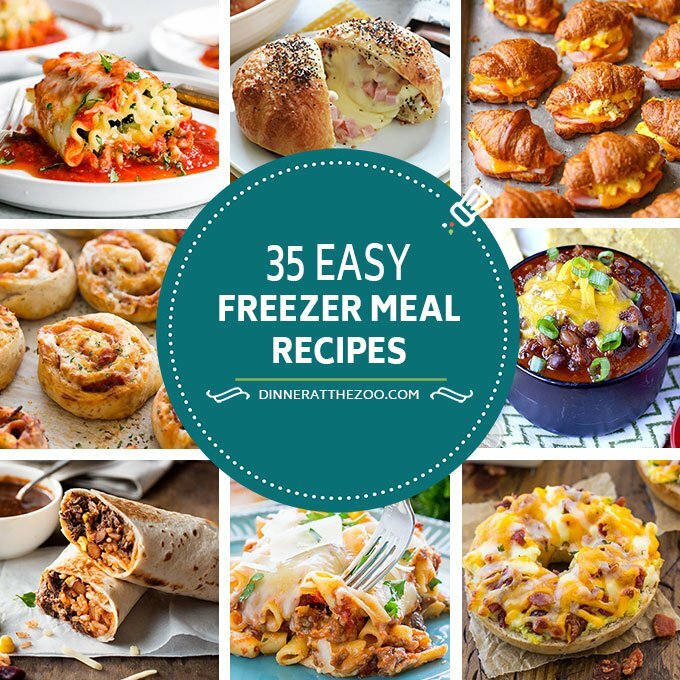 Here are 35 easy freezer meal recipes you can do one day a week and not have to worry about, “What’s for dinner/breakfast/lunch?” when you are ready to relax! Can I put a frozen casserole in the oven? Yes you can cook a casserole from frozen. The casserole will require a longer cooking time, typically 30 minutes longer than what the recipe specifies. You can tell if your casserole is heated through by inserting a thermometer into the center of the casserole. The thermometer will register 160 degrees F when it’s ready to serve. How do you freeze homemade soup? To freeze soup, the first thing you need to do is cool the soup, either in the refrigerator or by immersing the bottom of the soup pot in a container of ice. Then the soup can be packaged into freezer safe containers or resealable bags. If you pour the soup into resealable bags, remove the air, seal the bags and lay them flat in the freezer. To freeze in a container, simply seal the container and place in the freezer. How long can you keep homemade freezer meals? Generally speaking, most freezer meals will stay fresh for 2-3 months. After that time, you may experience a decline in quality. Be sure to label your freezer meals with the date they were cooked so that you know which ones to use first! This slow cooker beef and barley soup is a hearty meal that is so simple to make. You can layer the soup ingredients in a resealable bag, then freeze for up to 3 months. When you’re ready for soup, thaw the bag in the fridge overnight, place it in a slow cooker with some beef broth and dinner is done! Place the meat, celery, carrots, onion, garlic, thyme, bay leaf, salt, pepper and barley in a freezer safe resealable bag. Freeze for up to 3 months. Thaw the bag overnight in the refrigerator, then pour the contents of the bag into a slow cooker along with the beef broth. Cook for 6-8 hours on LOW, then serve. Adapted from New Leaf Wellness. Thanks for all these awesome ideas! It’s motivating me to get cooking! I keep saying that I’m going to make up some freezer meals and now that I have so many choices I need to get busy. I don’t think there is one on here I wouldn’t like. I need this right now! I have a huge order of chicken coming in next week and I need to know what to do with it! So much recipes to choose from! It’s always nice to make meals ahead so that you can go through the week without having to worry about time spent preparing meals! These are so perfect for me as a college student! I hardly ever have time to cook, but I definitely could take one Saturday and make meals for the future! 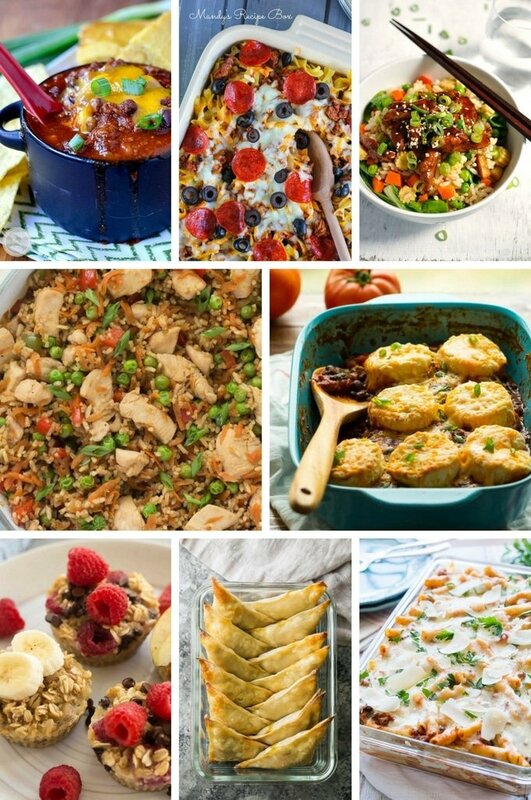 Thanks for all of these yummy freezer meal recipes!! 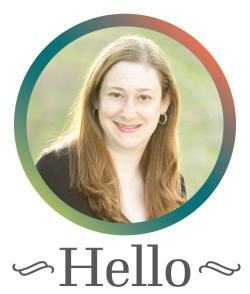 I am always on the hunt for a new recipe and seem like great ones! Freezer meals are the best. So much less effort is needed for dinners! Freezer meals are the best. I love the convenience of preparing something and freezing it for another day. I have a few options in my freezer right now. This post is a gold mine of recipes! Freezer meals are far better than eating out or getting boxed meals at the grocery store. I like to prepare our food myself and keeping some of them ready in the freezer would give me that assurance that my family will have something hearty and healthy to eat during those times when I am out on travel. Your rolled up lasagna inspired me to make it today. My husband will be happy, he has been craving lasagna for days. I seriously need to get on the meal prep bandwagon-I have no time to cook, and it’s going to get worse when I go back to work. These freezer meals are perfect! I don’t think meal planning is going to be successful without these types of recipes! I really appreciate them and I have a few things here that I want to try as soon as possible! I love freezer meals, they can save so much time and energy and money. This list has a few choices that I think I’d like to try. There are days wherein my husband and I are simply too busy to deal with making dinner at home! 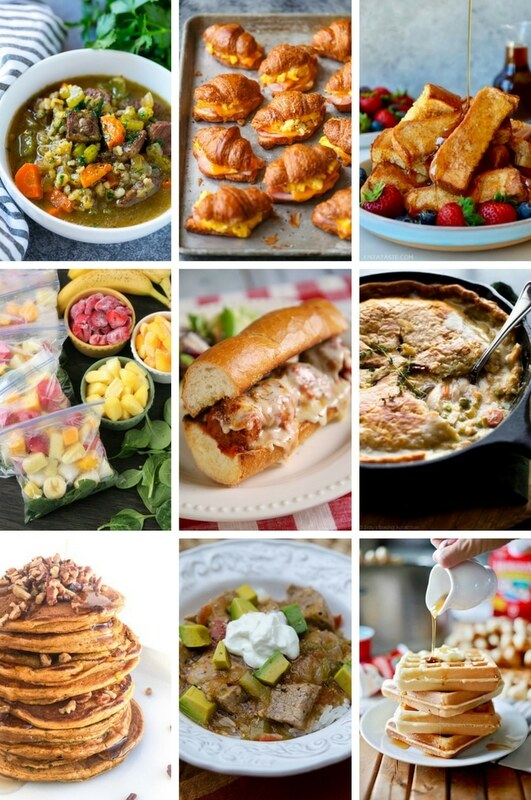 I’m so thankful for posts like this with lists of recipes! Yum, I must try this out! I hate to cook, so maybe if I planned ahead and had meals ready to go, I wouldn’t be so cranky about it. Everything here looks tasty! I do freezer meals all the time and it does save time and money. Especially on those days when we are in a hurry or to tired to cook. Stops us from eating out and spending even more money. Something here for everyone to enjoy. It would be nice to have a freezer full of meals that I only have to heat up on super busy days. Your Beef and Barley soup looks delicious. I need to make it and freeze the leftovers.